Families in San Cristobal open their homes and offer comfortable clean roooms, private or shared, to students from Instituto Jovel. Living with a family offers students the opportunity to be on round-the-clock contact with the Spanish language and Mexican culture and thus, further develop their comprehension and speaking abilities. All of our families live within walking distance from the center of town. The cost per person is $20 US dollars per night in a private room, including breakfast, and $18US dollarsper night in a shared room, also including breakfast. The main meal is in the afternoon (around 2-3pm). All prices are in US Dollars. Furnished apartments are available upon request. Most of them require a minimum stay of 4 weeks and prices vary depending on facilities and length of stay, with prices ranging from US$ 450.00 to US$ 800.00 per month. If you would like an apartment, please tell us your preferences for price range and amenities on your application form. 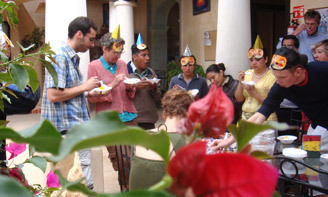 There is a wide variety of small and medium posadas in San Cristobal de las Casas. Posadas are usually family-operated small businesses, sometimes offering kitchen use and common areas, offering a middle ground between family stay and hotels. Posadas offer private rooms to make students feel at home, with either private or shared bath. Costs vary from about US$ 20.00 for very simple rooms to US$ 50.00 for rooms with private bath and extras. Let us know if you are interested in this option and if you would like recommendations or help from us. If you prefer to stay in a hotel, we can recommend one that meets your needs. Hotel rates vary from $60-$200 U.S. per night, depending on the facilities and services. There is an extensive variety of hotels in San Cristobal de Las Casas, from small, simple hotels to colonial mansions with inner court-yards and all the luxuries of modern hotels. We will help you make reservations. It is usually necessary to pay a deposit for the first night.